As all connoisseurs of fine crap are aware, the comic strip Space Moose, created by Adam Thrasher, was one of the finest, filthiest, funniest strips ever to savage our synapses. Unfortunately, the creator has not maintained a site archive, and other Space Moose archives go in and out of existence. So, to help make it easier to find Space Moose and corrupt/enlighten the minds of whoever needs it, I'm unnecessarily contributing to keeping this comic alive and throbbing - So ENJOY OUR THICK WAD OF TRAVESTY!!!! 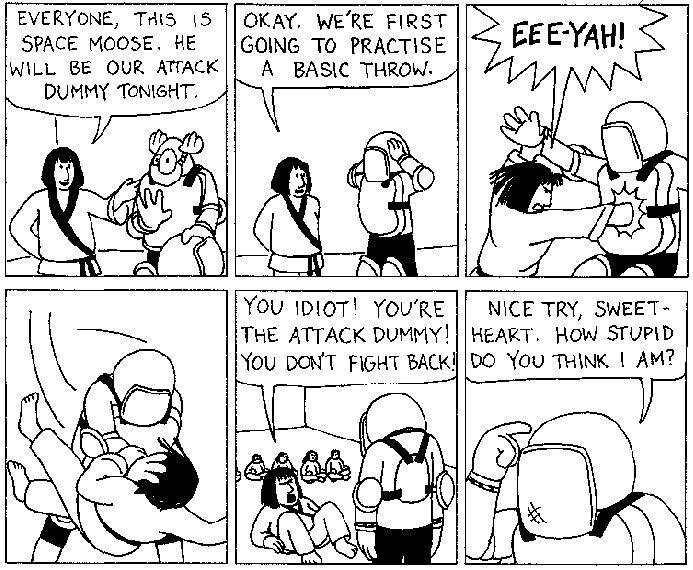 Space Moose was a comic strip featured in the The Gateway, The student newspaper at the University of Alberta from 1989 - 1999. Space Moose is Copyright © Adam Thrasher.